Securing the Supply Chain: How can we move towards a symbiotic relationship with our third parties? 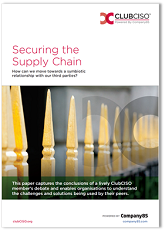 On the 9th of November 2017, a group of ClubCISO members sat down at a dinner to debate this question: Securing the Supply Chain: How can we move towards a symbiotic relationship with our third parties? This paper outlines the main talking points of the night and the personal perspectives of those who attended, and enables organisations to understand the challenges and solutions being used by their peers. We were also joined by guest contributor Ray Bilsby, CIO of the NSPCC, who shared his experience of managing the charity’s diverse and widespread IT supply chain. ClubCISO is a private members forum for senior EMEA information security professionals. This initiative is supported by Company85 and is designed to facilitate informal discussions, independent of vendors, on information security and cyber resilience in the organisation.